Thermography was first used in veterinary medicine 50 years ago. Originally, its use was limited for the most part to university hospitals or large referral practices. But over the last 20 years, thermography has been used practically in equine medicine. This is a physiological imaging modality that requires a learning curve for interpretation but it offers the operator new insight in to their patients. Thermographic instrumentation in the past has been divided into contacting and non-contacting devices.17 However, in the 1990s a new technology using focal plane array detectors made all older thermographic devices obsolete with regards to equine veterinary use. Focal plane array detectors are uncooled technology. This technology employs special lenses to focus infrared radiation on a series of detectors. These instruments are self contained and highly portable. One of the most important factors to consider before purchasing a thermographic camera is the spectral range.17 For medical use the range of 8 to 14 microns is ideal because this is the peak emissivity of skin. From a practical standpoint, there is also less environmental artifact at this range. The author prefers real-time thermography versus still thermography because real-time eliminates any problems with motion, makes thermographic assessment more dynamic in that the operator can immediately observe change, and allows for faster imaging. Sensitivity refers to the amount of temperature difference that can be detected; uncooled units can differentiate 0.1oC, which is sensitive enough for medical uses. The final factor is portability and durability. Uncooled cameras utilizing the focal array technology are very portable and durable because of no moving parts. The circulatory pattern and the relative blood flow dictate the thermal pattern, which is the basis for thermographic interpretation.15 The normal thermal pattern of any area can be predicted on the basis of its vascularity and surface contour. Skin overlying muscle is also subject to temperature increase during muscle activity. Based on these findings, some generalizations can be made regarding the thermal patterns of a horse: the midline will generally be warmer,9,15 this includes the back, the chest, between the rear legs, and along the ventral midline (see Fig 4.1). Heat over the legs tends to follow the routes of the major vessels, the cephalic vein in forelimb and the saphenous vein in the hindlimb. Injured or diseased tissues will invariably have an altered circulation.15 One of the cardinal signs of inflammation is heat which is due to increased circulation. Thermographically, the "hot spot" associated with the localized inflammation will generally be seen in the skin directly overlying the injury.1,2,4,5,9-16,23-25 However, diseased tissues may in fact have a reduced blood supply either due to swelling, thrombosis of vessels, infarction of tissues or change in sympathetic tone.15,16 With such lesions the area of decreased heat is usually surrounded by increased thermal emissions, probably due to shunting of blood. To produce reliable thermographic images certain factors need to be controlled: motion, extraneous radiant energy, ambient temperature, and artifacts.17 Motion can be controlled by immobilizing the horse in stocks or using a qualified handler. The use of real-time thermography eliminates the need for complete immobilization. Chemical restraining agents to keep the horse from moving should be avoided because these drugs affect the peripheral circulation and cardiovascular systems which could cause false thermal patterns to be produced; however, the author has not encountered this. To reduce the effects of extraneous radiant energy, thermography should be performed under cover shielded from the sun.15 Preferably, thermography should be done in darkness or low-level lighting. Ideally, ambient temperature should be in the range of 20oC (68oF) but any temperature as long as the horse is not sweating is acceptable. Heat loss from sweating does not occur below 30oC (86oF), as radiation and convection are responsible for heat loss below that temperature. Very cold environmental temperatures may cause vasoconstriction of the lower legs and interfere with imaging. In these cases, low level exercise to stimulate vasodilatation is necessary. The thermographic area ideally should have a steady, uniform airflow so that erroneous cooling does not occur. Practically, the horse should be kept from drafts. Likewise, the horse should be allowed 10-20 minutes to acclimate to the environment or room where thermography is performed. Artifacts are extraneous sources on the skin that can cause irregular images. Among theses are debris, scar tissue, hair length, liniments, leg wraps, and equipment.15 To avoid artifacts, make sure all subjects are groomed and free of leg wraps and equipment for two hours whenever possible. Hair insulates the leg and blocks the emission of infrared radiation. 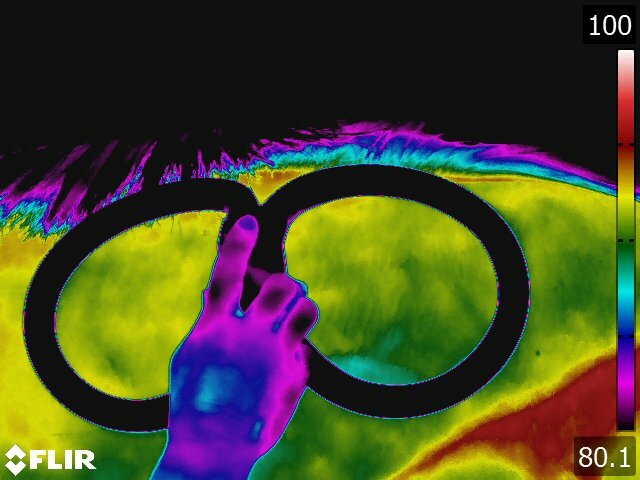 But, as long as the hair is short and of uniform length, the thermal image produced is accurate. The skin should always be evaluated for changes in hair length that may cause false "hot spots" in the thermogram. Multiple thermographic images of a suspect area should be made.24,25 The area in question should be evaluated from at least two directions approximately 90o apart, to determine if a "hot spot" is consistently present. The horse's extremities should be examined from 4 directions (circumferentially).15 Significant areas of inflammation will appear over the same spot on each replicate thermogram. 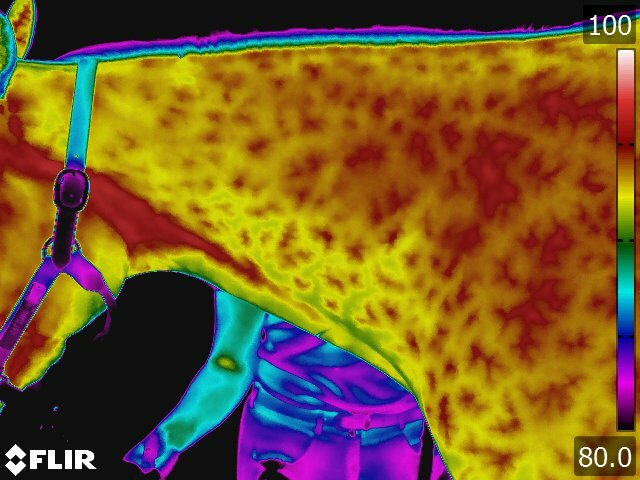 There are at least four ways in which thermography can be utilized in equine veterinary practice. The first, is as a diagnostic tool. In these cases, thermography is a physiologic imaging method where a 1.0ºC difference between two anatomically symmetrical regions indicates a region of inflammation.17 A decrease in temperature is just as important as an increase in temperature. The image will identify an area of interest to pursue with an anatomic imaging method such as ultrasonography and /or radiography. The second method is to enhance the physical examination. In this case, thermography is used to identify changes in heat and therefore locate "areas of suspicion".17 Thermographic cameras are easily 10 times more sensitive that the hand in determining temperature differences. This method simply helps identify asymmetry and then the practitioner must utilize the information to determine the actual cause and significance of the temperature difference. The third method of using thermography is in a wellness program. In this method, horses in training are followed on a routine basis, once weekly.18 In the author’s experience, thermographic changes often occur 2 weeks prior to clinical changes. In these cases, thermography can be used to identify subclinical problems then training alterations can be made so that injury may be avoided altogether. The fourth method is in the regulation of equine events.17 Presently, thermography is used by the Federation Equestre Internationale (FEI) and the United States Department of Agriculture (USDA) to enforce regulations. The instrument is used as a screening tool to determine potential misuse. In these cases, the final determination is made by a group of examining veterinarians. The camera is positioned 90 degrees to the area of interest and the sequential images are taken. The limbs are examined from all four directions, the neck from both sides and ventrally, the torso from both sides, dorsally and ventrally, the shoulders from the front and both sides, the hips from both sides and the back, and the head from both sides, dorsally and ventrally. Each of the images is then assessed in relation to the findings of the clinical examination of the horse. Thermography of the hoof has been useful for the diagnosis and evaluation of several conditions of the foot.9,13,15 Laminitis, palmar foot pain, subsolar or submural abscesses, corns and any other inflammatory condition of the hoof are specific conditions where thermography provides valuable information concerning the disease. Obviously, thermography is not needed to definitively diagnose these problems. Thermography does however; provide additional information that is helpful in localizing the problem, assessing the degree of inflammation associated with it, and deciding the best course of treatment. Thermographic evaluation is particularly helpful with early or occult conditions of the foot, where the physical and/or radiographic examination findings are inconclusive. Normally, the coronary band is the warmest area of the leg and because of this, inflammation of this area can be difficult to detect.9 The hooves should be thermographically compared in several ways. Comparisons should be made between all four hooves, front to front and front to rear. A difference of more than 1oC between hooves is significant. In cases where all four feet are involved, comparisons of the hoof temperature with the temperature of the area between the bulbs of the heel should be made. Laminitis is characterized by inflammation of the laminar structures of the hoof. Laminitis can be divided into 4 phases: developmental, acute, chronic, and post chronic, and each of the phases has characteristic thermal information. The developmental stage has been studied thermographically the least. During the developmental stage there are no clinical signs but the thermal image changes. There are progressive periods of vasoconstriction followed by periods of profound vasodilatation; the heat seen gets hotter and broader following each vasoconstricitve period. During the acute phase a change in the thermal pattern of the hoof wall is useful in recognizing laminitis. Generally, the coronary band is 1-2oC warmer than the remainder of the hoof. An inflammatory problem is indicated when the hoof begins to approach the temperature of the coronary band. Thermography can also be very beneficial in the progressive evaluation of the contralateral limb where support limb laminitis is potential sequelae. 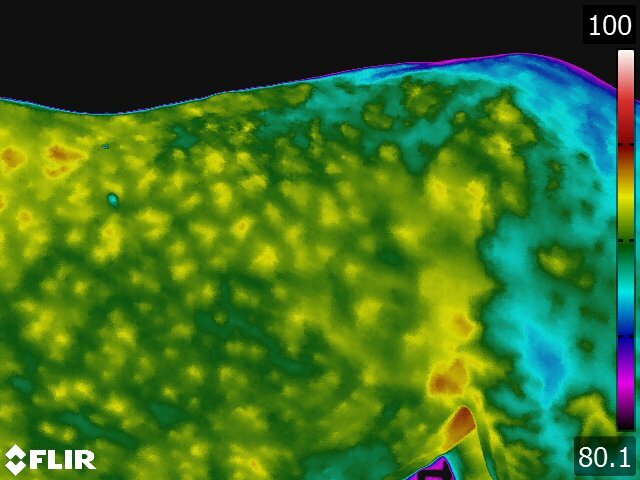 Thermography makes it possible to detect inflammation in the contralateral foot well before lameness is evident. Preventative therapy can therefore be instituted sooner in the course of disease and hopefully before the laminitis is irreversible. The chronic phase is characterized by progressive displacement of the third phalanx. The thermal image is the opposite of the acute phase. As the coffin bone displaces the vasculature is pulled further away from the surface causing the thermal image to appear progressively cooler. That is the coronary band is more difficult to distinguish from the remainder of the hoof wall. Finally, the post chronic phase is seen when the laminae have healed but vascular changes (damage) persists secondary to coffin bone displacement. Thermal imaging can be useful to identify the vascular damage that has occurred. These will be seen as areas of intense cold which will identify the areas of vascular damage. Thermography is also an excellent method of evaluating the patient with palmar foot pain syndrome.14 The author has never identified a consistent thermal pattern associated with these cases, but has been able to characterize reduced blood flow to the caudal hoof and to identify thermal stresses associated with hoof imbalance and superficial inflammatory disease. Thermography is one of the few methods that can readily determine the relative blood flow to the palmar foot area. This is accomplished by thermographically evaluating the foot both before and after exercise. The normal horse will sustain a 0.5oC increase in temperature of the foot after exercise but about 40 % of horses with palmar foot pain syndrome will not sustain this increase in the caudal foot due to the low blood flow. This is in sharp contrast to other focal inflammatory conditions of the hoof such as bruises, or fractures, which are characterized by focal areas of increased temperature that correspond to the site of injury. Exercise in these cases intensifies the "hot spot." Hoof abscesses before they drain are often seen as relatively cold areas. This is due to the pressure caused by the abscess which decreases the circulation to the abscessed area. The hoof capsule is a closed environment, and the swelling that occurs due to the abscess is seen thermographically as an abnormal cold area. Once the abscess opens and the pressure is relieved the cold area changes to a hot area. Joint inflammation produces characteristic thermal patterns. The best view to study most joints is from the dorsal aspect.13,23 Typically, the normal joint is cool compared to the surrounding structures. An exception to this rule is the hock, which has a vertical "hot spot" along the medial aspect that corresponds to the saphenous vein. (see Fig 4.3) As a joint becomes inflamed, the thermal pattern changes to an oval area of increased temperature that is centered over the joint and widest horizontally medial to lateral. The exception to this rule is the joints of the distal limb, where the thermal pattern associated with inflammation of this joint is a circular pattern. The areas of joint capsule attachment tend to be "hotter" but the center of the joint is relatively "cooler". This may be due to joint swelling or pressure and subsequent loss of microcirculation. (see Fig 4.4) No specific correlation can be made between heat and joint damage. The temperature of the joint appears to be related to many factors; the chronicity of the problem, (the more chronic the problem, the less heat) the degree of synovial involvement, the actual amount of cartilage damage, and the presence or absence of osteochondral fragments. These factors have a complicated interaction and all affect the inflammatory response of the joint temperature. The degree to which each affects this response has yet to be determined. 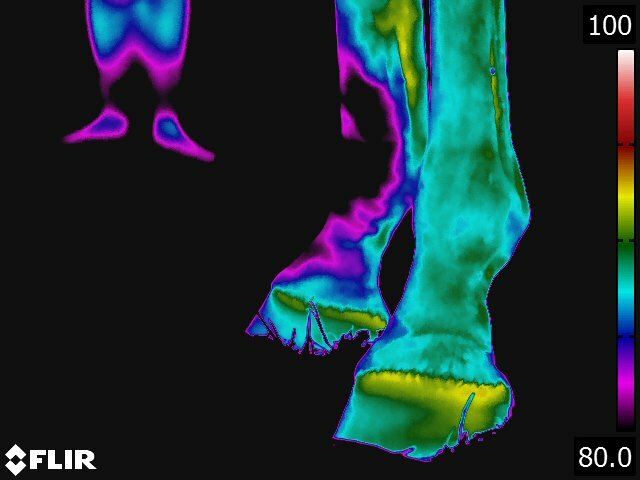 Thermal patterns of joints have been shown to change two weeks before the onset of clinical signs of lameness.18,23 In this manner, thermography can be used to assist training and help prevent serious injuries. By locating inflammation before clinical signs are evident, training programs can be changed to reduce stress on the inflamed area thereby preventing serious injury. Thermography is of less value in the diagnosis of most long bone problems. Since thermography evaluates skin temperature, a bone needs to be in relatively close contact with the skin to affect its temperature.2 Consequently, bones that are heavily covered with muscle cannot be as accurately assessed by thermography. Thermography is best utilized to evaluate dorsal metacarpal disease or stress fractures of the radius or tibia. Dorsal metacarpal disease, the so-called "bucked shin complex", is categorized into 3 grades.7 Grade 1 is characterized by eliciting pain upon palpation of the cannon bone but radiographic evidence of bone pathology cannot be identified. Grade 2 is characterized by pain over the cannon bone, but there is radiographic evidence of subperiosteal callus. Finally, grade 3 is characterized by cannon bone pain and radiographic evidence of a stress or fatigue fracture. Grades 2 and 3 may be indistinguishable and radiographic confirmation of a stress fracture may not be possible for 2 to 3 weeks. Thermal variations between the latter two may help differentiate grade 3 lesions earlier than radiographs. Grade 1 and 2 disease are characterized by "hot spots" located midshaft over the dorsal cannon bone. The "hot spot" is generally 1-2oC warmer than the surrounding tissues. In contrast, the grade 3 disease has "hot spots" that are not centrally located, and are usually seen on the lateral and medial views in addition to the dorsal view. These areas are characteristically 2-3oC warmer than the surrounding tissues. Since thermographic changes typically precede radiographic changes by 2 weeks,13 with accurate thermography, a tentative diagnosis can be made earlier and appropriate treatment measures taken sooner. Thermal patterns of the normal flexor tendons are bilaterally symmetrical and consist of elliptical isothermic zones.11,12 The lowest temperature is centered over the palmar aspect of the tendons and the peripheral areas near the carpus and fetlock are approximately 1oC warmer. Acute tendinitis invariably causes a "hot spot" over the site of the tendon lesion.12 (see Fig 4.5)The "hot spot" of a tendon lesion can usually be demonstrated up to 2 weeks before physical evidence of swelling and pain around the tendon. Therefore, tendon lesions of potentially clinical significance can be identified and adjustments in the training protocol can be made to prevent further damage to the tendon. As the tendon heals the thermal pattern becomes more uniform but remains abnormally elevated, when compared to normal tendon.12 As the lesion heals and scar tissue is deposited, the skin over the injured area may actually show a decrease in temperature, whereas, the remaining neovascularized tendon continues to have increased thermal emissions. During the assessment of healing, the thermal changes do not correlate well to the structural reorganization of the tendon matrix as assessed by ultrasonography.4 The reason is that as the tendon undergoes neovascularization, the thermal pattern diffuses so there is no longer a "hot spot". But, if one compares healing tendon to a normal tendon, there is overall increased thermal emissions from the damaged tendon. Mechanical stress proximal to the injury can aggravate the existing tendon damage. 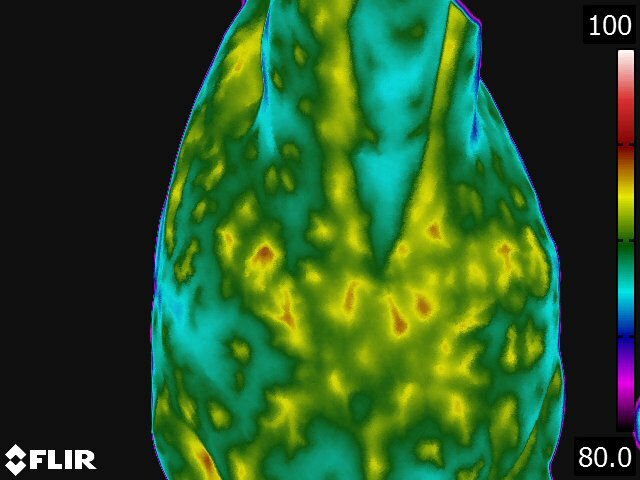 Again, thermography can detect these areas of proximal stress before they cause a clinical problem and, therefore specific imaging can be used to decide if a therapeutic desmotomy should be performed. Thermographically, ligament injuries will appear very similar to tendon injuries. "Hot spots" can be expected to be centered over the injured area. (see Fig 4.5) An exception to this is in some high suspensory injuries of the metacarpi; the dorsal thermal image of the injured leg shows a focal "hot spot" located proximally on the cannon bone. This is interesting considering the inflammation and pain would be expected to be on the palmar aspect of the limb. Clinically, thermography is most useful when trying to correlate if there is heat associated with a sensitive ligament. This is particularly true of the suspensory ligament where the clinical significance of palpable sensitivity within the body of the ligament can be difficult to determine. Thermography can be used to determine if there is inflammation associated with the sensitivity. In a similar vain, "splints" or metacarpal callus can cause suspensory desmitis. Thermography can detect if there is inflammation associated with the suspensory ligament adjacent to the "splint". These indications would apply to any ligament. Thermography may have its greatest clinical application in the assessment of individual muscle injuries which are difficult to diagnose.16 Even though serum muscle enzyme elevation may non-specifically indicate muscle damage, the specific muscle or muscles damaged may be difficult to identify. Thermography offers two types of information important in the evaluation of muscle injury: first it can locate an area of inflammation associated with a muscle or muscle group; and second it can illustrate atrophy well before it becomes apparent clinically. Muscle inflammation will be most commonly seen thermographically as a "hot spot" in the skin directly overlying the affected muscle.16 On a rare occasion, swelling and edema in the affected muscle will be severe enough to inhibit blood flow through the muscle. In this case the injured muscle will be seen thermographically as a "cold spot". Thermographic evaluation of muscle must be made from the right and left sides. These comparison images should be nearly identical. Consistent variations from side to side would indicate muscle damage located at either the "hot" or "cold spot". The most common cause of muscle inflammation is muscle strain. A classification of first, second or third degree strain injuries, described in human athletes, has been applied to horses.16 Muscle strains have not been commonly documented in the forelimb. The author has most commonly identified pectoralis and shoulder extensor myopathies. Thermographic description of muscle strains of the back and hindlimb muscles have been best described.16 These strains have been termed croup and caudal thigh myopathies. Croup myopathies are actually strains of the longissimus, the origin of the gluteus medius (level of the sacroiliac), the body of the gluteus medius, the insertion of the gluteals on the greater trochanter and the third trochanter of the femur. Caudal thigh myopathies consist of injuries to the biceps femoris, semitendinosus or semimembranosus muscles. Injuries to the biceps femoris and semimembranosus most commonly are mid body muscle strains but, semitendinosus injuries usually occur at the musculotendinous junction. 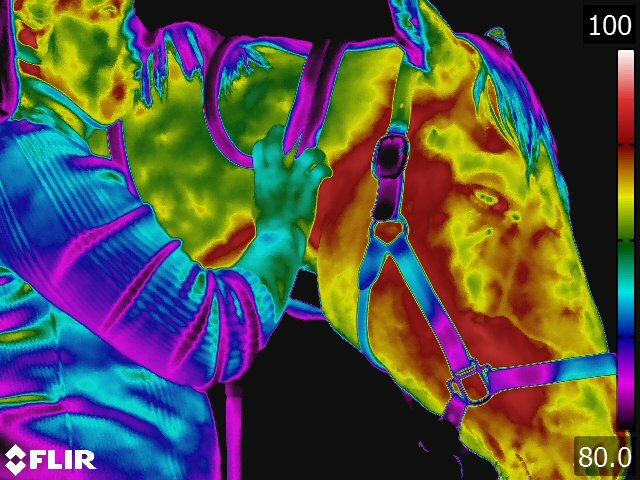 Diagnosis of injuries to the vertebral column can be aided through thermography.13 Many of these injuries are undiagnosed or the diagnosis is delayed because radiography of the equine spine is difficult, and/or may require general anesthesia. Thermography offers a distinct advantage as it is best performed on the standing animal and in suspect cases may be used as a general screening test to determine if referral for radiography is warranted. Injuries to the vertebral column are characterized by either "hot spots", "cold spots", or "root signatures". Thermography has been used to identify 6 different back injuries; over-riding dorsal spinous processes (kissing spines), dorsal spinous ligament injuries, muscle pain, withers injuries, sacroiliac problems, and saddle fit problems.19 The author uses 2 different thermal images to assess the back, one a thoracolumbar view and the second a croup view.19 The thoracolumbar view shows the withers and the sacrum, and is especially good for looking at the mid back region. The croup view is best for evaluating the sacroiliac region. The thermal pattern is the most important aspect of assessing the thermogram of the back. It must be remembered that thermography establishes the location of a possible problem but does not characterize the lesion. However, there are certain thermal patterns that have been seen consistently with particular back problems. The normal back thermal pattern is: warmest down the midline, cooling slightly in the lumbar region; warm from tuber coxae to tuber coxae and over the tuber sacrale; and the same warmth down the middle of the croup.19 (see Fig 4.1) The warm area has symmetric isothermic bands on either side. Any variation of this pattern is either due to an artifact (thin hair, rubbed area) or pathologic process. If the lesion occurs along the midline of the thoracolumbar area, radiographs of the thoracolumbar spine is indicated. If the lesion occurs off the midline or in the croup region, we usually image the area with ultrasonography. Overriding spinous processes or kissing spine has been associated with any one of three different thermal patterns.21 Pattern 1: a hot streak perpendicular to the thoracic spine (see Fig 4.6), pattern 2: a cold streak perpendicular to the thoracic spine, and pattern 3 (the most common): a combination hot spot-cold streak pattern over the back. Our practice has evaluated over 150 cases over a 5 year period of time. And has determined that the sensitivity of thermography to diagnose overriding spinous process is 99%; however, the specificity was only 70%. This results in a positive predictive value of 91% compared to the positive predictive value of palpable pain in the thoracolumbar area for kissing spine of 67%. Dorsal spinous ligament injuries have not presented with that type of pathognomonic thermal pattern.19 Thermographic changes associated with this injury have been increased heat, decreased heat, or simply an abnormal back thermogram. The lesion in our hands has been detected using ultrasonography after knowing there is an abnormal thermogram. 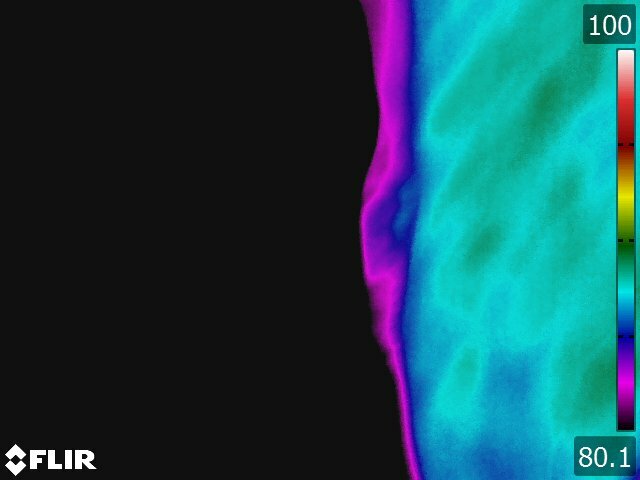 Sacroiliac region thermography has shown several different patterns.19 The most common pattern is a cold area centered over the region of the tuber sacrale. (see Fig 4.6) This finding of cold is hypothesized to be due to lack of normal movement in the sacroiliac region. This lack of movement can be either due to primary pathology or secondary to other causes of the horse not moving normally through the pelvic region. This has been consistent with our clinical findings as well. 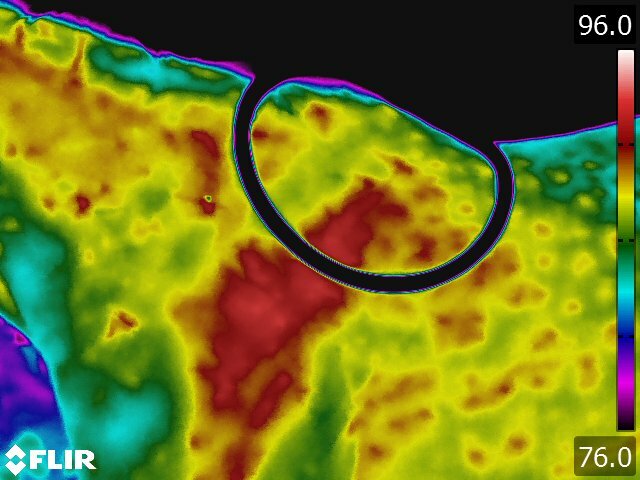 Specifically, we have found that only about half the horses exhibiting this thermal pattern actually show pain in the sacroiliac area. In addition, sonographic evaluation reveals pathology in only about half the cases and this pathology usually looks chronic in nature. We have identified both thinning and thickening of the cross sectional diameter of the dorsal sacroiliac. In cases with a cold area and palpable pain, we will sonographically examine the sacroiliac region. On the other hand, if there is no pain or the horse moves normally through the pelvis we look for other causes of loss of back mobility. Pathology is seen much more commonly if the area over the tuber sacrale is hot or if there is a hot spot centered over one tuber sacrale or the other. The pathology varies from hypoechoic areas within the dorsal sacral ligaments to generalized edema in the region. This thermographic pattern is almost always associated with either pain or marked stiffness in the sacroiliac region. Saddle fit thermography is very interesting and requires multiple examinations.20 In evaluating the dynamic interaction between the saddle and the horse’s back, thermography will show not only the heat generated in contact areas on the saddle but also the physiologic effects of the saddle on the horse’s back. Our protocol is to perform a baseline thermographic examination of the horse’s back and again after the horse has been worked under saddle. The horse should be saddled with a simple cotton pad with the girth tightened as it would be for riding. The horse is then lunged for at least 20 minutes. The horse should be exercised at its normal gaits (walk, trot, canter) and equally in both directions. Both the bottom of the saddle and the horse’s back are evaluated. The most important criterion for the saddle is thermal symmetry. In regards to the horse, due to the heat generated by the saddle, the horse’s midline is now colder than the other structures under the saddle. In addition, the examiner is looking for focal hot spots, particularly along the spine, or hot or cold spots over the musculature. These abnormalities indicate problems caused by the saddle. The assessment is then repeated after a similar exercise session with the rider mounted. This evaluation allows consideration of the effect of the rider on the horse’s back. 1. Bowman KF, Purohit RC, Ganjam UK, et al: 1983. Thermographic evaluation of corticosteroids efficacy in amphotericin B induced arthritis in ponies. Am J Vet Res 44:51. 2. Goodman PH, Healset MW, Pagliano JW, et al: 1985. Stress fracture diagnosis by computer-assisted thermography. Phys Sportsmed 13:114. 3. Genovese RL, Rantanen NW, Hauser ML, et al: 1985. Clinical application of diagnostic ultrasound to the equine limb. Proc Annual Meeting Am Assoc of Eq Practnr 30:701. 4. Hall J, Bramlage LR, Kantrowitz BM, et al: 1987. Correlation between contact thermography and ultrasonography in the evaluation of experimentally-induced superficial flexor tendinitis. Proc Annual Meeting Am Assoc of Eq Practnr 32:429. 5. Lamminen A, Meurman K: 1980. 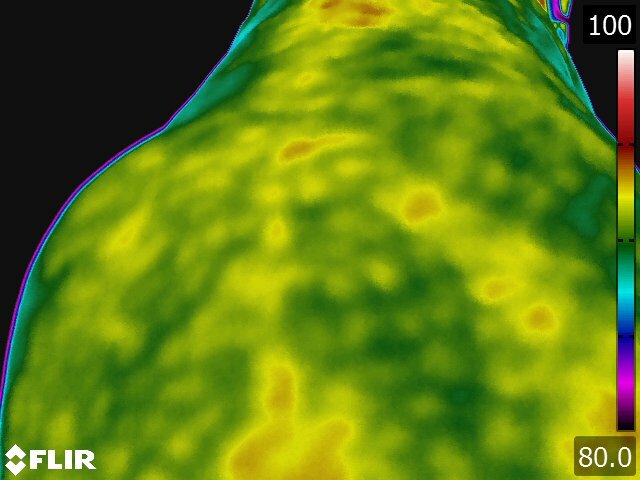 Contact thermography in stress fractures. Acta Thermographica 5:89. 6. Love TJ: 1980. Thermography as an indicator of blood perfusion. Ann NY Acad Sci 335:429. 7. Norwood GL, Haynes PF: 1982. Dorsal metacarpal disease. In Mansmann RA, McAllister ES (eds) Equine Medicine and Surgery. Santa Barbara. American Veterinary Publications, p1110. 8. Palmer SE: 1981. Use of the portable infrared thermometer as a means of measuring limb surface temperature in the horse. Am J Vet Res 42: 105-108. 9. Purohit RC, McCoy MD: 1980. 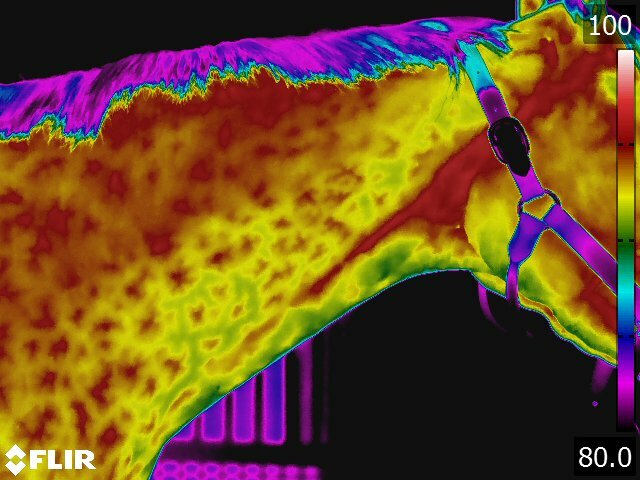 Thermography in the diagnosis of inflammatory processes in the horse. Am J Vet Res 41:1167. 10. Purohit RC, McCoy MD, Bergfeld WA: 1980. Thermographic diagnosis of Horner's syndrome in the horse. Am J Vet Res 41:1180. 11. Stein LE, Pijanowski GJ, Johnson AL, et al: 1988. A comparison of steady state and transient thermography techniques using a healing tendon model. Vet Surg 17:90. 12. Stromberg B: 1973. 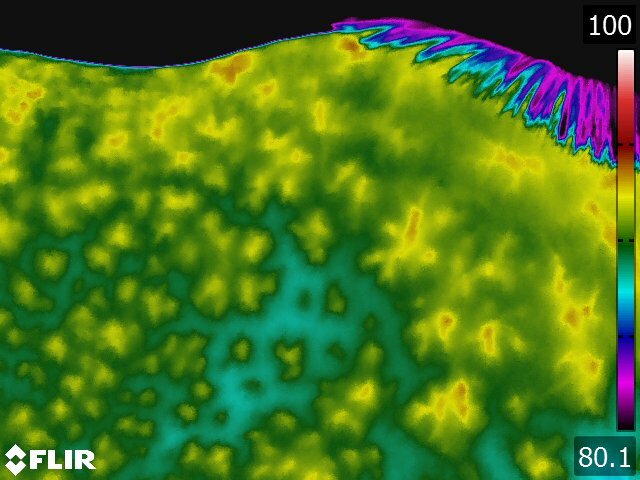 Morphologic, thermographic and 133Xe clearance studies on normal and diseased superficial digital flexor tendons in race horses. Eq Vet J 5:156. 13. Stromberg B: 1974. 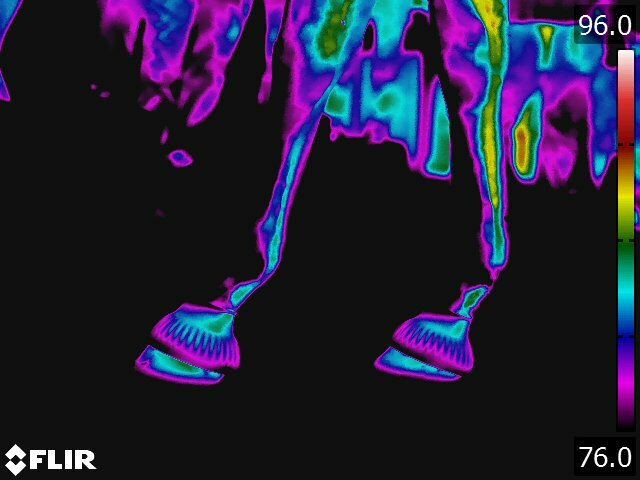 The use of thermography in equine orthopedics. J Vet Radiol 15:94. 14. Turner TA, Fessler JF, Lamp M, et al: 1983. Thermographic evaluation of podotrochlosis in horses. Am J Vet Res 44:535. 15. Turner TA, Purohit RC, Fessler JF: 1986. 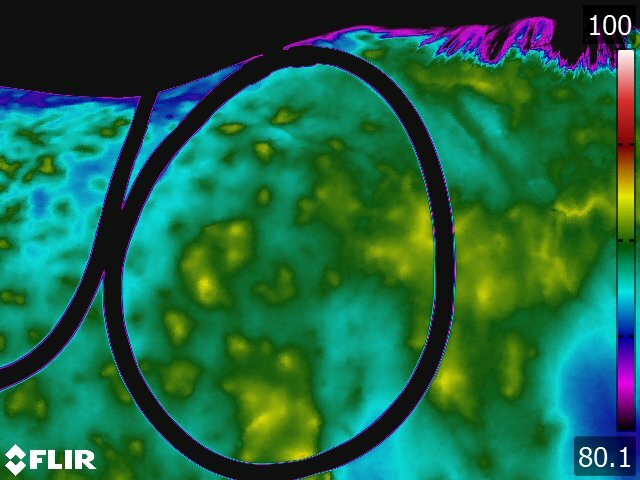 Thermography: A review in equine medicine. Comp Cont Ed 8:855. 17. Turner TA 2001. Diagnostic thermography. Vet Clin North Am (Equine Pract); 17:95-114. 19. Turner TA: 2003. Back problems in horses, in Proceedings. 49th Annual American Association of Equine Practitioners Convention; 71-74. 20. Turner TA: 2004. How to assess saddle fit in horses, in Proceedings. 50th Annual American Association of Equine Practitioners Convention; 196-201. 22. Ueltschi G: 1977. Bone and joint imaging with 99mTc-labeled phosphates as a new diagnostic aid in veterinary orthopedics. J Am Vet Radiol Soc 18:80. 23. Vaden MF, Purohit RC, McCoy MD, et al: 1980. Thermography: A technique for subclinical diagnosis of osteoarthritis. Am J Vet Res 41:1175. 24. Weinstein SA, Weinstein G: 1985. A review of 500 patients with low back complaints; comparison of five clinically-accepted diagnostic modalities. Proc Acad Neuro Musc Thermography 2:40. 25. Weinstein SA, Weinstein G: 1985. A clinical comparison of cervical thermography with EMG, CT scanning, myelography and surgical procedures in 500 patients. Proc Acad Neuro Musc Thermography 2:44.